TheBlueGuerilla: Vance And Anderson In Race To Become New Tory Youth Women's Chairman As Hilley Steps Down. Vance And Anderson In Race To Become New Tory Youth Women's Chairman As Hilley Steps Down. CLARE GEORGE-HILLEY has stepped down as Conservative Future Women's (CFW) Chairman after 2 years in the top job for the organisation she launched with Home Secretary Theresa May in January 2012. The dramatic move is set to change the young Tory female landscape and has signalled a possibly sensational campaign to be the next CF Women's Leader, with a couple of names already being whispered in the wind. Sources suggest hardworking executive members Aisha Vance and Elizabeth Anderson are being tipped as possible successors to Hilley, TBG can exclusively reveal. Only CWF members can vote and TBG can disclose the organisation has around 650 girls that are eligible to vote in the ballot, which will take place at the AGM on Tuesday 18th March in Parliament at 7pm. Attendees will be joined by Charlotte Leslie MP. Nominations for Chairman are now open to all CFW members and close on Friday 28th February. 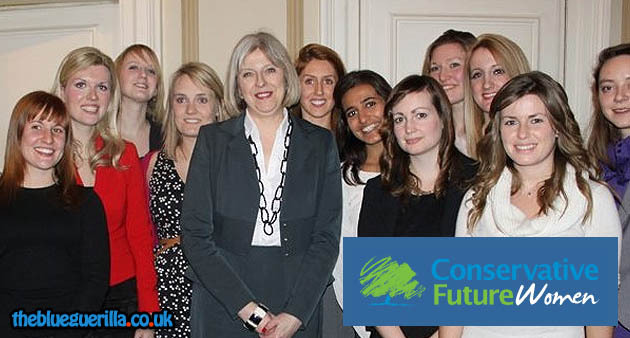 To nominate yourself email Clare at, clare@conservativefuturewomen.co.uk. Upon departure Clare George-Hilley said - "I am very proud of what CF Women has achieved in such a short space of time and would like to thank my dedicated and hard-working team who has made all of this possible." pretty sure jasmine is running!